LOOKING BEYOND STRATEGY AT THE STILL-HIDDEN FLAWS IN IRAN DEAL. 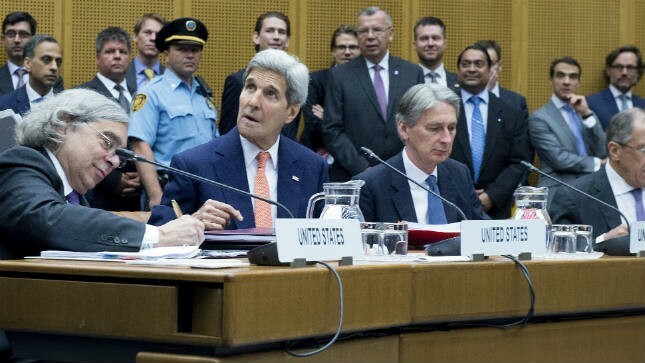 THE NEW IRAN AGREEMENT HAS ALREADY BEEN WIDELY CRITICIZED ON MILITARY OR STRATEGIC GROUNDS. For the most part, these critiques have been right on the mark. After all, there is little doubt that the proposed pact — allegedly designed to prevent Iranian nuclearization — would effectively render Iranian nuclearization a fait accompli. But there are also major legal or jurisprudential liabilities of the agreement, still-hidden flaws that have yet to be meaningfully understood, or even mentioned. Here, the most ominous risks have to do with permitting Iran to enrich uranium after 15 years. These plainly ironic allowances contradict the 1968 Non-Proliferation Treaty (NPT), especially those pertinent treaty portions that obligate Iran, as well as all other non-nuclear member states, to remain non-nuclear in perpetuity. More precisely, the NPT mandates a compliant period of "indefinite duration." There is more. International law is part of the law of the United States. It follows, according to Article Six of the U.S. Constitution — the so-called "Supremacy Clause" — that any U.S. entry into the new Iran agreement must substantially violate American law, specifically, the "supreme law of the land." The United States, of course, is an original nuclear-weapon state party to the NPT. A SECOND LEGAL CONTRADICTION CONCERNS THE OBAMA ADMINISTRATION'S EXPRESSED UNWILLINGNESS TO ABIDE BY THE 1948 GENOCIDE CONVENTION. More particularly, the American president refused to base this country's negotiations with Iran upon a contingent expectation that Tehran's leadership abrogate genocidal statements. These conspicuous declarations regarding Israel, a country smaller than America's Lake Michigan, are plainly impermissible. Incontestably, they reveal a thoroughly egregious violation of both international and national law. Although not generally known, the Genocide Convention criminalizes not only genocide per se, but also "conspiracy to commit genocide," and "direct and public incitement to commit genocide." Does the United States have any discernible "contractual" obligation to enforce such major treaty prohibitions in its nuclear diplomacy with Iran? Although the language of the Genocide Convention does not explicitly require any such precise enforcement, all treaties are premised upon the "peremptory" doctrine of pacta sunt servanda (Latin for "agreements must be honored"). Further, a U.S. obligation is clearly deducible from Article V of the convention, which calls for international cooperation in providing "effective penalties" for those who have engaged in "incitement to commit genocide," and also from Article VIII, which requires "any contracting party" to bring all unlawful behavior before "competent organs of the United Nations." Once again, there exists a binding intersection of U.S. constitutional law and international law. Because of the Supremacy Clause, and assorted Supreme Court decisions, especially the Paquete Habana (1900), this country's open failure to enforce anti-genocide norms in its nuclear dealings with Iran constitutes an unassailably serious violation of U.S. law. On purely moral grounds, moreover, this indisputable failure is similarly insidious. A THIRD PROBLEM WITH THE NEW IRAN AGREEMENT IS LESS A MATTER OF EVIDENT JURISPRUDENTIAL CONTRADICTIONS THAN OF "NAIVE LEGALISM," that is, of automatically assuming that realistic compliance is built into the codifying language. Here, long-standing legal philosophy has recognizable pride of place, and it is appropriate to recall the cautionary words of Thomas Hobbes, a seminal thinker whose Leviathan was already well-known to Thomas Jefferson, and was thereby important to drafting America's Declaration of Independence: "And Covenants, without the Sword, are but Words," cautioned the 17th-century English thinker, "and of no strength to secure a man at all." To be sure, the new "Covenant" with Iran is "but Words." It can never expectedly override Tehran's irremediable preference for creating military nuclear options. Plausibly, over time, IRAN'S CADRE OF INTERNATIONAL LAWYERS WILL EMBARK, MORE OR LESS OPENLY, ON A CALCULATED STRATEGY OF UNILATERAL "TREATY" TERMINATION. Pursuant to the governing "treaty on treaties," the 1969 Vienna Convention on the Law of Treaties, these Iranian advocates will then settle upon a suitable number of "permissible exceptions" to pacta sunt servanda. At that time, these allegedly lawful exceptions will likely include the international law doctrine of rebus sic stantibus ("so long as conditions remain the same"), an exculpatory principle now stating that core obligations of the nuclear agreement can be terminated whenever a fundamental change occurs in certain circumstances that had existed when the agreement was first executed. Will such a qualified change in circumstances actually have taken place? Probably not. But that reality will not constrain the Iranian lawyers. Looking ahead, there are other strategies of unilateral termination that Iran could and most likely would invoke. One of these conveniently malleable grounds, identified at Article 48 of the Vienna Convention, affirms that "A State may invoke an error ... as invalidating its consent." Another, codified at Article 52, indicates that any formal international agreement is void "if its conclusion has been procured by the threat or use of force." Still another predictable ground for future Iranian legal manipulation can be found at Article 53, the so-called "jus cogens" or peremptory norm section of the Vienna Convention. This all-too-relevant article states that "A treaty is void if, at the time of its conclusion, it conflicts with a peremptory norm of general international law." In this case, Iran could claim, several years hence, that the agreement had improperly impaired its sovereignty — incontestably, a peremptory norm of general international law — and is, therefore, not legally binding. On its face, perhaps, any such expressed Iranian rationale would appear to contradict elementary logic. After all, Iran would already have acknowledged this corrosive effect at the time of its initial agreement. Nonetheless, a usable case could conceivably be fashioned by Iran that would combine this particular rationale for abrogation with an argument of rebus sic stantibus — that is, that the foreseeable circumstances that had existed originally, no longer exist. Alternatively, at least in the closing years of this agreement, Iran could decide that it would be better to remain in the pact, at least in principle, but to simultaneously quit the NPT. The rationale of any such contrary strategy would be that the newer pact will allow full nuclearization after the 15-year duration, while the NPT could never make such an allowance. Per Article X of the NPT, Iran's withdrawal could rest on the acceptable argument that any continued agreement membership would jeopardize its "supreme interests." It could do this very easily, of course, merely by giving "three-months notice." Military and strategic failings of the new Iran agreement should be granted pride of place in any identification of prospective risks. At the same time, the United States is normally represented as a law-abiding nation, and this agreement's stark subversion of both international and national law could not simply be ignored. To be sure, the new pact would have devastating security consequences for both the United States and Israel, but this should not stand in the way of simultaneously recognizing its overwhelming illegality. Indeed, such corollary recognition could prove decisive in offering necessary arguments for an 11th-hour rejection of this uniquely bad agreement.